The system of tight security cooperation is unpopular with many Palestinians. But it has helped anchor the authority’s control in parts of the Israeli-occupied West Bank, and Israeli officials say the program has helped thwart many terrorist attacks. “Things will be very difficult,” Mr. Abbas said on Sunday, according to the official Palestinian news agency Wafa, “and we do not gamble with the fate of our people.” But Mr. Abbas added that a firm position would hopefully result in the removal of the metal detectors as well as the cessation of Israeli military incursions into West Bank cities — a longer-standing demand. 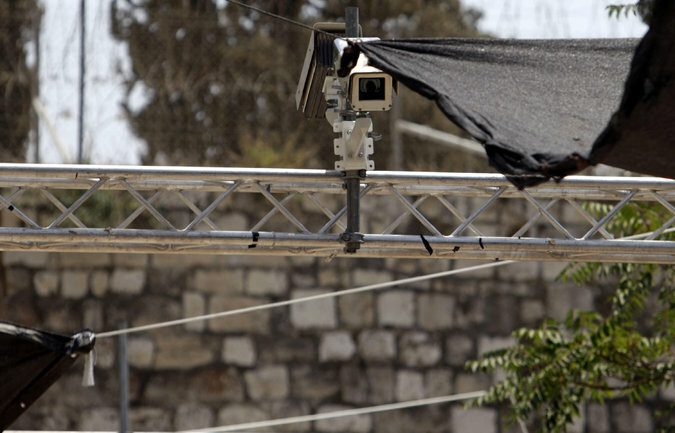 One of the new security cameras installed at the entrance to Al Aqsa Mosque. 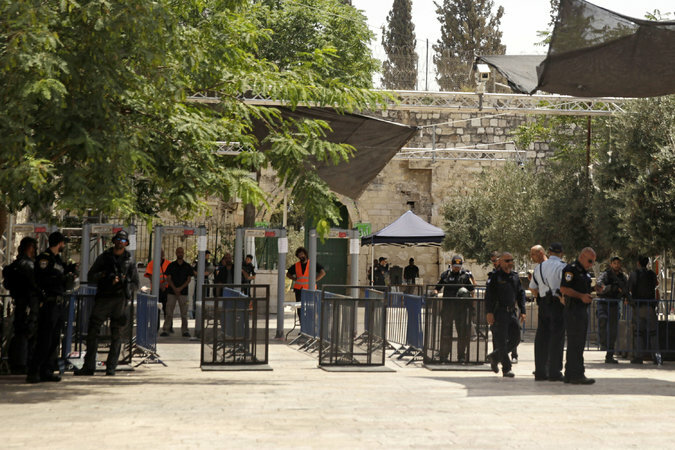 The crisis over the metal detectors is the latest, symbolic manifestation of a struggle over ownership and control of the contested holy site, revered by Jews as the Temple Mount and by Muslims as the Noble Sanctuary. Israel introduced the electronic gates more than a week ago at two entrances to the sacred esplanade and closed other access points for Muslims. It was a hurried response to a brazen attack on the morning of July 14, when three armed Arab citizens of Israel emerged from Al Aqsa Mosque and fatally shot two Israeli Druze police officers who were guarding the compound. Israel insisted that the new security measure did not mean any change to the delicate, decades-old status quo governing the running of the site. But that did not convince the Palestinians or other Arab governments, including Jordan. The Israeli cabinet met hours after the funerals of three Israeli victims of a terrorist attack on Friday night in the West Bank settlement of Halamish. Yosef Salomon, 70; his daughter, Chaya Salomon, 46, a teacher; and his son, Elad Salomon, 36, a father of five, were stabbed to death by an attacker identified as Omar al-Abed, 19, a Palestinian from a neighboring village who entered the house. Elad Salomon’s wife, Michal, managed to escape upstairs with their children and hid them in a bedroom. The carnage ended when an off-duty soldier in a house across the street heard the family’s screams and shot Mr. Abed through a window, wounding him. The attacker was treated in an Israeli hospital and is in custody. Ismail Haniya, the senior leader of Hamas, the Islamist movement that controls Gaza, called Mr. Abed’s father and praised the attacker as a “hero,” officials in Gaza confirmed. Israel introduced the electronic gates more than a week ago. Earlier Friday, three Palestinians, two of them in their late teens, were shot dead in clashes with Israeli security forces that broke out after the Muslim noon prayer in and around East Jerusalem. Palestinian medics reported that a fourth Palestinian was killed in clashes on Saturday in the town of Al-Azariya on the eastern edge of Jerusalem. He was identified as Yousef Abbas Kashour, 21. He said he had made the decision after a discussion with the top security leadership. Tension built over the following days, but the cabinet chose to leave the metal detectors in place. Yoav Galant, the Israeli minister of housing and construction and a general, was one of a minority of ministers who had voted to remove them. He said he did so because the Palestinians were using them to whip up emotions against Israel and because the equipment was impractical, as the tens of thousands of Muslims who come to pray at Al Aqsa on Fridays would not have been able to pass through the security check in a reasonable amount of time. In Jerusalem’s Old City on Sunday, Muslim men laid their prayer mats on the ground near the Lion’s Gate, a few yards from the metal detectors, and performed noon prayer in the sweltering heat, under the gaze of armed Israeli police officers. Young boys handed out bottles of mineral water. A group of women laid down mats and prayed separately a few yards away; some had brought picnics. Worshipers said they viewed the metal detectors as an Israeli provocation, and a humiliation. Clashes resumed at the Lion’s Gate after nightfall.